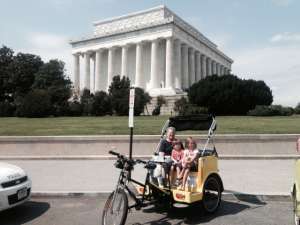 There is convenient handicap parking for disabled visitors right on Daniel French Drive on the south side of the Lincoln Memorial. Private vehicles without a handicap tag are forbidden from even entering Daniel French Drive. You can access Daniel French Drive if you are headed west on Independence Avenue or if you are headed west along Ohio Drive SW.
On the south side of the staircase leading up to the interior of the Lincoln Memorial, there is a ramp. Follow this ramp and just to the left of the stairs you will see an open doorway. This doorway leads to both the restroom area and also to an elevator that will bring you up to the inner sanctum. From here, you have the best view in Washington DC down the Reflecting Pool and towards the Washington Monument and the US Capitol beyond. There is a National Park Service information kiosk very near the Lincoln Memorial handicap parking. 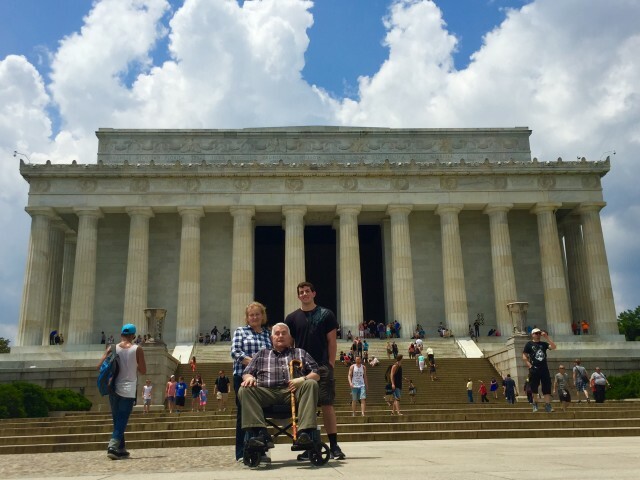 With an ID, they will lend you a folding wheelchair to visit the Lincoln Memorial as well as the Korean War Memorial and the Vietnam War Memorial. The Korean War Memorial is nearby to the Lincoln Memorial and the Lincoln Memorial handicap parking spots. There are no steps within the Korean War Memorial. The Vietnam Memorial is on the north side of the Lincoln Memorial. Unfortunately, this is at a bit of a distance from the Lincoln Memorial handicap parking spots. Unfortunately, there are no dedicated handicap parking spots near the Vietnam Memorial. Does the Lincoln Memorial Include a Special Honor to the Disabled? Many people have suggested that the hands of the Abraham Lincoln statue subtly form an “A” and an “L” in American sign language. This is not the official interpretation of the National Park Service. However, the sculptor of the statue, Daniel French, had a son who was deaf. They communicated in sign language. In other statues sculpted by Daniel French, the hands on the statues are also said to contain sign language symbols related to each statue. Finally, Abraham Lincoln signed into law the Lands Grant Act, which funded universities across the United States. Among those universities was Galludet University right here in DC — the first university for the deaf in the nation.